Delegate « sharkpool » - profit sharing pool 90%. Approximate payout, every 12 hours: 2.7 ARK / 10K VOTE. 13.5 ARK / 50K VOTE. 27 ARK / 100K VOTE. @rodisoto I sent you an award. If you did not receive payment, let me know and I will send you the award. hi i only hvae 86 coins. do i get any profit for you as a vote? You’ll get the reward, but you have to wait a certain amount of time. You can follow your reward on the site after you have voted. click on the link https://sharkpool.pro/stats/voter/ . I sent you a reward https://explorer.arknode.net/tx/e37c9ea28e5584e9482e8ba9eef33654392fd093b2497bfb54f088e8866cecc5, thanks for saying. Dear users. If you do not receive your reward, write to me and I will send you your reward. Also today, there will be an update of the contest information. @mr.Escanor I didnt receive my last forge reward, as the transaction was faulty. Why does your website show this failed forge reward payout with a fake transaction number? How do i receive my 5.6 ark? @mr.Escanor i received my reward just now. THANK YOU. i will continue to support sharkpool! Network fee deduced:0.1. i checked and got nothing. Here is my ark address ALH4oouJjTuVJF6t285S3H3riRP6aqt2U8. Thank you for verifying and letting me know. @acey123 I sent you a reward https://explorer.arknode.net/tx/17af978f9b37539d6123a1548392675de9d39e36df0f28ea9c7bc87d7925e852 , thanks for saying. @mr-Escanor my payment didn’t go through on 23nd December. @Lifter_Dan I sent you a reward https://explorer.arknode.net/tx/5947552f730343a944a79bc80b25cc5b9d8cfe8c640f0afb674968b4f65da4a0 , thanks for saying. My payment didn’t go though. @cryptojames I sent you a reward https://explorer.arknode.net/tx/970f86e13c7640b209b717d62383c696fea067edf17bc2ae9e9f9f6647ecef78 , thanks for saying. Friends, we need to 60k ARK that your favorite pool is back in the top. Dear friends, the contest is postponed to January 31.The contest will be played 200 ARK! 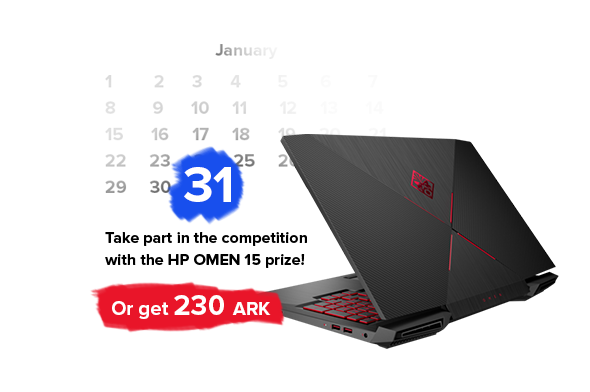 As I promised, after half a year, will be the main prize “new laptop HP OMEN 15” or the winner will be paid the equivalent amount of the prize, which means that the first place will be sent 175 ARK. Please note that you must have a minimum of 1 ARK to participate in the contest. @mr.Escanor what is the contest? or you will reveal it on 31 january? Looks like your connection to Delegate « sharkpool » - profit sharing pool 90%. Approximate payout was lost, please wait while we try to reconnect.